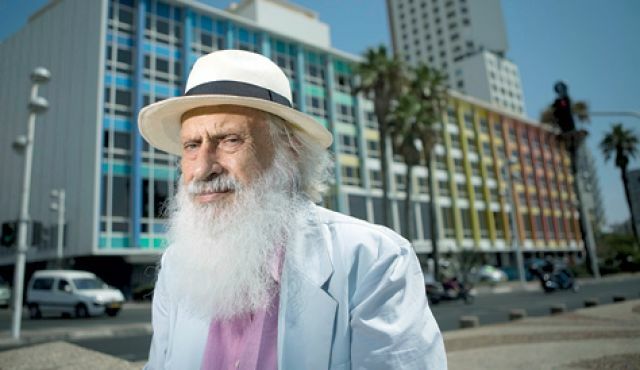 Yaacov Agam – Born in 1928, Yaacov Agam (nee Yaakov Gipstein) is one of the bestselling Israeli artists famous for his kinetic sculptures and prismatic agam-ograph images that include secular abstracts as well as Judaic subjects. 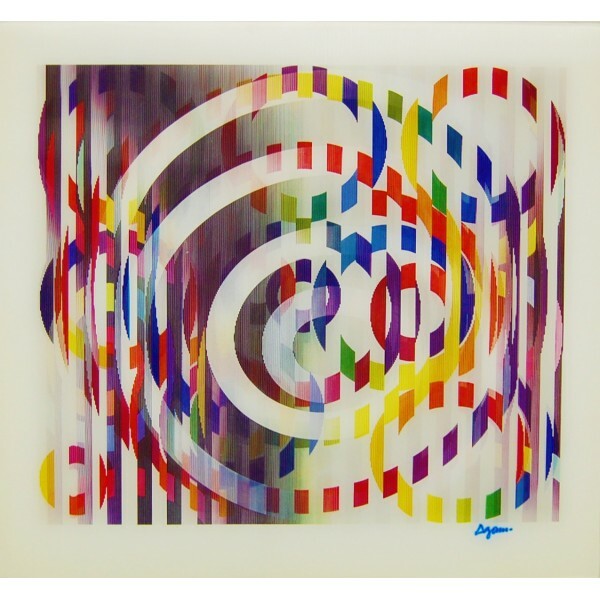 Agam was born in Israel and studied art in Jerusalem before working with some of the leading artists in Europe. By the 1960’s, Yaacov Agam became a mainstream sensation with his cutting-edge optical art, lenticular prints and geometric abstracts that translated exceptionally well into the textile mediums, including carpets and tapestries. Yaacov Agam has been honored with retrospective expositions at the Guggenheim and the Musée National d’Art Moderne in Paris. Right in the centre of the great Guggenheim rotunda, Agam erected a monumental sculpture over fourteen metres high called the Tour Aenaitral (Aenaitral Tower), an anagram of Anita and Earl, the names of the Warsaw couple who commissioned the work. It comprises thirty-six superimposed parts measuring 1.44 x 1.44 metres on each side and its top reaches the upper ramp of the museum. Each side of the superimposed pieces is cut on the oblique and the tower is painted on all four sides using the same system as the three dimensional strips in his polymorphic paintings. The tower’s structure recalls Agam’s pictorial vocabulary from the early 1950s, but its rhythmic ascent is also reminiscent of Constantin Brancusi’s Colonne sans fin (Infinite Column) erected in the Tîrgu Jiu Park in Romania 1937. Besides each conveying their own particular, and very different, artistic style, Agam’s tower and Brancusi’s column both have in common the idea of a steady vertical climb symbolising an aspiration towards the infinity of space, an ascension towards the spiritual invisibility hidden in the ethereal light of the cosmic void. Agam’s sculpture rises on a vertical, central axis, and the space around it, in which works of art unfold in their often-halting climb, is lent weight by the circular ramp surrounding it. The visitor walking up or down this ramp gives a raison d’être to the empty space, and the thirty-six parts of the Tower create a rising and falling polyphony that may be observed from any point on the circular ramp, which is finally endowed with its own vocation. 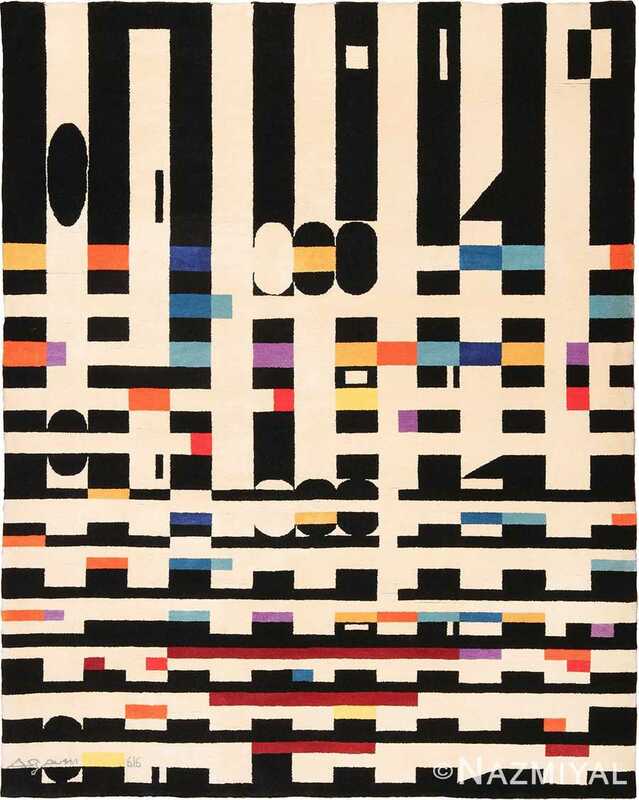 Beautiful Rugs and abstract art By Yaacov Agam – Bright colors and optical illusions don’t sound like ideal elements of rug design. But when Yaacov Agam does it, the result is an abstract a masterpiece. The Israeli-born artist has a unmatched talent for transforming colors into tangible works of art. It is an unexpected technique for textiles, but with his genius, it translates beautifully. An accomplished painter, sculptor and experimentalist, his work is in Paris’s Musee National D’Art Moderne and New York’s Guggenheim Museum and Museum of Modern Art. Hailed as the highest-selling Israeli artist, he was also awarded the Jan Amos Comenius Medal by UNESCO for his educational outreach. Despite this international reputation, Agam’s work isn’t exclusive to the world’s art elite. Some of his greatest pieces are arguably his vintage rugs from Nazmiyal. With his signature abstract style enhanced by the tangibility of textiles, they take viewer perceptions – and interior design – to a whole new level. 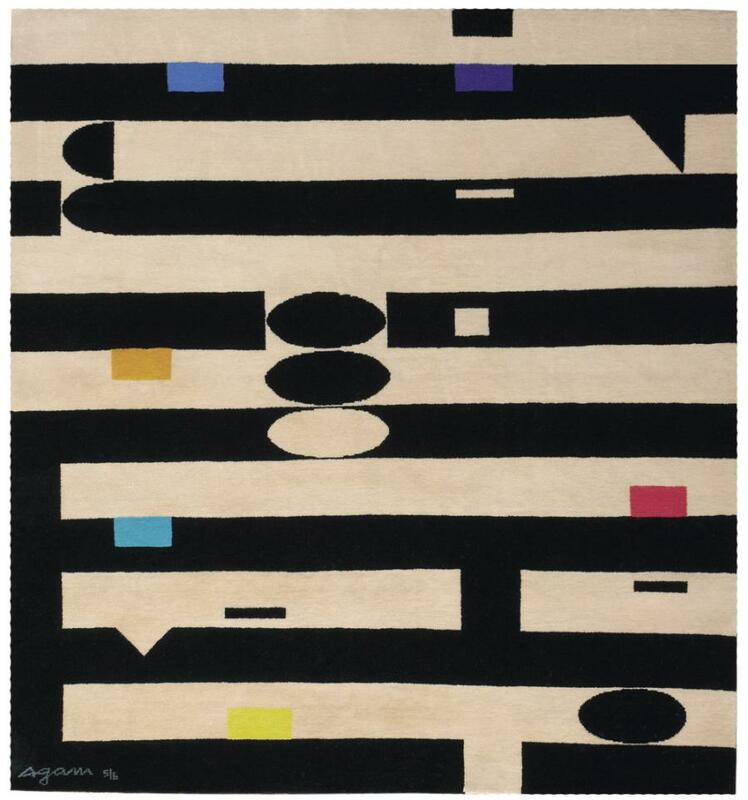 What do you think of Agam’s rugs? Let us know in the comments below! 1984 From the 2nd, to the 3rd into the 4th Dimension, Clayton Art Gallery, st. Louis. 1960 Construction and Geometry in Painting: from Malevich until Tomorrow, Galeire Chalette, New York (and tour).